7. IS SUNDAY MENTIONED IN THE NEW TESTAMENT? IS SUNDAY MENTIONED IN THE NEW TESTAMENT? If the day was changed by BIBLE authority — if Christians are to find any BIBLE AUTHORITY whatsoever for observing Sunday as the "Lord's Day" today — then we must find that authority in one of these eight texts! Let us acknowledge at the outset, since the seventh day of the week is clearly established as the Bible Sabbath up until the time of the crucifixion, that there can be no BIBLE AUTHORITY for Sunday observance unless we find it clearly and plainly stated in one of these eight New Testament passages. (1) Matthew 28:1: "In the end of the sabbath, as it began to dawn toward THE FIRST DAY OF THE WEEK, came Mary Magdalene and the other Mary to see the sepulchre." This is the first place in the Bible where "the first day of the week" is mentioned. Matthew wrote these words, under inspiration of the Holy Spirit, six years after the New Testament Church came into being. The text says that after the Sabbath day it was drawing TOWARD (Greek, into) the first day of the week. So this scripture, we must admit, tells us plainly that three days and three nights after all that was done away had been securely "nailed to the cross," the Sabbath was still the day BEFORE the first day of the week — still the seventh day of the week. One point is here plainly proved. Many tell us that the Sabbath command was merely for "one day in seven" — that it did not have to be THE seventh day of the week, but merely the seventh part of time. They argue that Sunday, being one day out of seven, fulfills the command. But here is a passage in the NEW Testament, inspired by the Holy Spirit six years after the beginning of the NEW Testament Church, stating in plain language that, three days after all abolished things had been done away, the Sabbath still existed and that it was the seventh day of THE WEEK — the day before the FIRST DAY OF THE WEEK. That much is proved, and must remain settled for all who honestly seek and accept BIBLE authority. But, was the day changed later? (2) Mark 16:2: "And very early in the morning THE FIRST DAY OF THE WEEK, they came unto the sepulchre at the rising of the sun." This is merely Mark's version of the sunrise visit to the tomb. It was written ten years after the crucifixion. This first day of the week, also, was "AFTER the Sabbath was PAST," according to verse 1. So this text proves the same thing as the one above — that the first day of the week was not at that time (three days after the crucifixion) the Sabbath, but the day AFTER the Sabbath. The Sabbath, then, still was the SEVENTH day of the week. (3) Mark 16:9: "Now when Jesus was risen, early the FIRST DAY OF THE WEEK he appeared first to Mary Magdalene, out of whom he had cast seven devils." This text speaks of Jesus' appearance to Mary Magdalene later the same day — the day AFTER the Sabbath. Nothing here calls the first day of the week the Christian Sabbath, we must admit. Nothing here calls it "The Lord's Day." Nothing here hallows Sunday or says God made it holy. Nothing here commands us to observe it. Nothing here sets it apart as a memorial of the resurrection, or for any purpose. No command or example of REST on this day — no authority for observing Sunday here. (4) Luke 24:1: Now UPON THE FIRST DAY OF THE WEEK, very early in the morning, they came unto the sepulchre, bringing the spices which they had prepared, and certain others with them." This text tells again the same event recorded by Matthew and Mark, and it shows that on THE FIRST DAY OF THE WEEK these women came to do the work of a common weekday, AFTER having rested the Sabbath day "according to the commandment." For we read, in the verse just before this, "And they returned, and prepared spices and ointments; and rested the Sabbath day according to the commandment." Shall we say these women did not yet know the commandment was abolished? No, we cannot, for this statement was not made by the women, but inspired by the HOLY SPIRIT. God did know it was not abolished. And it was written approximately thirty years after the establishing of the New Testament Church! God then inspired the direct statement that the "rest" of these women on the Sabbath day was according to the commandment, which statement would not be possible had the commandment been abolished. This text, then, establishes Sunday as a common workday, three days after the crucifixion, and it further establishes that at that time the command to rest on the Sabbath had not been abolished. (5) John 20:1: "THE FIRST DAY OF THE WEEK cometh Mary Magdalene early, when it was yet dark, unto the sepulchre." This, written sixty-three years after the crucifixion, is merely John's version, describing the same visit to the tomb. It confirms the facts above. Was This a Religious Meeting to Celebrate the Resurrection? Were they assembled to celebrate the resurrection, thus establishing Sunday as the Christian Sabbath in honor of the resurrection? The text says they were assembled "for fear of the Jews." The Jews had just taken and crucified their Master. They were afraid. The doors were shut because of their fear — probably bolted. Why were they assembled? FOR FEAR OF THE JEWS, according to this text, and also because they all lived together in this upper room (Acts 1:13). They could not have assembled to celebrate the resurrection, for THEY DID NOT BELIEVE JESUS WAS RISEN (Mark 16:14; Luke 24:37, 39, 41). Nothing in this text calls this day "Sabbath," or "Lord's Day," or any sacred title. Nothing here sets it apart, makes it holy. No authority here for changing a command of God! Lord's Supper Day — or Workday — Which? Notice, Paul continued his speech until midnight! "And there were many LIGHTS in the upper chamber, where they were gathered together." It was AFTER SUNSET, prior to midnight, the first day of the week. Now at that time the first day of the week did not begin at midnight, as men begin it today. It began, and the seventh day ended, AT SUNSET! All Bible days begin and end at SUNSET. Throughout the Roman world at that time, and for a few hundred years afterwards, days began and ended at sunset. The practice of beginning the new day at midnight was started much later. Therefore this meeting, and Paul's preaching, took place during the hours we now call SATURDAY NIGHT — it was not a Sunday meeting at all! Notice the rendering of Today's English Version, correctly translated from the inspired Greek text: "On Saturday evening we gathered together for the fellowship meal. Paul spoke to the people, and kept on speaking until midnight, since he was going to leave the next day." Paul and his companions had been in this town of Troas seven days. His companions had left by ship after sunset. Paul remained behind for a farewell meeting. He preached until midnight, "ready to depart on the morrow." At break of day — sunrise Sunday morning — Paul departed (verse 11). Now notice what his companions had done. "And we went before to ship, and sailed unto Assos, there intending to take in Paul: for so had he appointed, minding himself to go afoot. And when he met with us at Assos, we took him in" (verses 13-14). Look at this on the map (next page). Paul's companions had to sail around a peninsula — a distance of fifty or sixty miles, while Paul, afoot, walked across, a distance of 19 1/2 miles. He was able to walk this distance in shorter time than they could sail the much longer distance, which gave Paul the opportunity to remain behind after they left, for this last farewell sermon and visit. Now do you see what actually happened? Paul's companions were engaged in the LABOR of rowing and sailing a boat while Paul was preaching that Saturday night until midnight — on the first day of the week. They had set sail Saturday night, AFTER THE SABBATH HAD ENDED. Paul remained behind for one more last farewell sermon. Then, at break of day Sunday morning, Paul set out afoot, indulging in the labor of a 19 1/2 — mile walk from Troas to Assos! He waited till the Sabbath was past for this long walk — a good hard day's work, if you ever tried it! He did it on the first day of the week! Again, a common workday! Jesus had introduced the "Lord's Supper" as part of the Passover, at the beginning of the annual "days of unleavened bread." No longer need they kill lambs or eat the roasted body of Passover lambs, after Christ, OUR Passover, had been once slain for us. Yet the Passover was ordained FOREVER (Ex. 12:24). At His last Passover supper, Jesus substituted the wine as the emblem of His blood, instead of the blood of the slain lamb. He substituted the unleavened bread for the roast body of the lamb as the symbol of His body, broken for us. The disciples continued to observe the Passover annually, now in the form of "the Lord's Supper" using only the bread and wine, as a MEMORIAL (I Cor. 11:24) of Christ's DEATH (I Cor. 11:26), showing His death till He comes again. They continued to observe the days of unleavened bread (Acts 20:6). This year they had observed the days of unleavened bread and the "Communion" service at Philippi, after which they came to Troas in five days, where they remained seven days. After the Sabbath day had ended, at sunset, "upon the first day of the week ... the disciples came together to BREAK BREAD." People have ASSUMED this expression to mean the taking of "Communion." But notice! Paul preached, and continued preaching until midnight. They had no opportunity to stop and "break bread" until then. When Paul "therefore was come up again" — after restoring the one who had fallen down from the third balcony — "and had broken bread, AND EATEN (verse 13). Note it! "Broken bread AND EATEN." This breaking bread was not Communion — it was simply eating a meaL This expression was commonly used of old to designate a meal. It still is used in that sense in parts of even the United States. Notice Luke 22:16, where Jesus was introducing the Lord's Supper, taking it with His disciples. He said, "I will not any more eat thereof, until it be fulfilled in the kingdom of God." Yet, the day after His resurrection, after walking with the two disciples to Emmaus, "... as he sat at MEAT with them, he took bread, and blessed it, and brake, and gave to them" (Luke 24:30). Here Jesus "brake bread" but it was not the Lord's Supper, which He said He would NOT take again. It was a meal — "He sat AT MEAT." Notice Acts 2:46. The disciples, "continuing daily with one accord in the temple, and breaking bread from house to house, did eat their meat with gladness." Here again "breaking bread means EATING A MEAL. Not on the first day of the week, but DAILY. Again, when Paul was shipwrecked on the voyage to Rome, the sailors had been fasting out of fright. But "Paul besought them all to take MEAT, saying, This day is the fourteenth day that ye have tarried and continued fasting, having taken nothing. Wherefore I pray you to take some MEAT: for this is for your health .... And when he had thus spoken, he took bread, and gave thanks to God in presence of them all: and when he had broken it, he began to eat" (Acts 27:33-35). Here Paul broke bread to give to unconverted sailors who were hungry. The truth is, NOWHERE IN THE BIBLE is the expression "breaking of bread," or "to break bread," used to signify observance of "the Lord's Supper." In all these texts it means, simply, eating a meal. So, when we read in Acts 20:7,11, "the disciples came together to break bread," and how Paul had "broken bread and EATEN," we know by Scripture interpretation it referred only to eating food as a meal, not to a Communion service. We come now to the eighth and last place where the term "first day of the week" occurs in the Bible. (8) I Corinthians 16:2: "Upon the FIRST DAY OF THE WEEK let every one of you lay by him in store, as God hath prospered him." "But now I go unto Jerusalem to minister unto the saints. For it hath pleased them of Macedonia and Achaia [where the Corinthian church was located] to make a certain contribution for the poor saints which are at Jerusalem .... When therefore I have performed this, and have sealed to them this fruit, I will come by you into Spain" (Rom. 15:25-28). It says, "Let every one of you lay by him in STORE." Note it! LAY BY! STORE UP! Store up BY HIMSELF — at home! Not lay by at the church house — lay by HIM — at home. Now WHY? That there be no GATHERINGS when I come.' Men GATHER fruit out of the orchard — they GATHER vegetables out of the ground, to be STORED UP. But putting coins in a collection plate at church, or handing in your tithe envelope could not be called a GATHERING, but an offering or collection. Notice further: "And when I come, whomsoever ye shall approve by your letters, them will I send to bring your liberality unto Jerusalem. And if it be meet that I go also, they [more than one] shall go with me" (verses 3-4). So, once again, the last and final text in the Bible where we find THE FIRST DAY OF THE WEEK mentioned, it is a WORKDAY — a day for gathering fruit and food out of the orchards and the fields and gardens, and storing it up. It was to be the FIRST labor of the week, hence the first day of the week, as soon as the Sabbath was past! So, finally, we find upon honest examination that NOT ONE of the texts speaking about "THE FIRST DAY OF THE WEEK" sets it apart as a rest day. Not one makes it holy, calls it the Sabbath or by any other sacred title. In EVERY case, the first day of the week was a common workday. Sometimes Revelation 1:10 is used as Bible authority for calling Sunday "the Lord's DAY." It says: "I was in the Spirit on the Lord's day, and heard behind me a great voice." But this does not say the "first day of the week," or "Sunday" is the "day" here called "the Lord's day." As a matter of fact, it is not speaking of ANY day of the week at all, but of "the day of the Lord" — the time of the coming PLAGUES, climaxing in the coming of Christ, and the millennium. This is the THEME of the Revelation. But, if one wants to argue, and insist upon this text applying to some definite day of the week, he shall have to look elsewhere to see WHICH day THE BIBLE calls the LORD'S DAY. For this text does not designate ANY day of the week. But Jesus said He was Lord of the SABBATH, and if He is LORD of that day, then it belongs to Him, and is His day, and therefore the Sabbath is the Lord's Day (Mark 2:28). Isaiah 58:13 calls the Sabbath (the seventh day of the week) "MY HOLY DAY." God is speaking. So the Sabbath is THE LORD'S DAY. 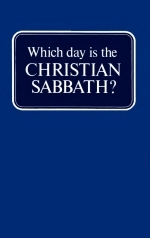 In the original commandment, in Exodus 20:10, we read: "The seventh day is the sabbath OF THE LORD THY GOD." Not MY day, or your day. Sunday is MY day. So is Monday, and every other weekday, for my labor and my own needs. But the seventh day is NOT mine — it is THE LORD'S! It belongs to HIM, and He made it HOLY, and commanded us to KEEP it that way. We have no right to use it for ourselves. It is HIS DAY! Now briefly let us look through the New Testament to find WHICH DAY Paul kept and taught Gentile converts to keep. (1) Acts 13:14-15, 42-44: "But when they departed from Perga, they came to Antioch in Pisidia, and went into the synagogue ON THE SABBATH DAY, and sat down. And after the reading of the law and the prophets the rulers of the synagogue sent unto them, saying, Ye men and brethren, if ye have any word of exhortation for the people, say on." "And when the Jews were gone out of the synagogue, the GENTILES besought that these words might be preached to them THE NEXT SABBATH. Now since Paul was preaching "the grace of God" (verse 43), here was his opportunity to straighten out these Gentiles, and explain that the Sabbath was done away. Why should he wait a whole week, in order to preach to THE GENTILES ON THE NEXT SABBATH? If the day had now been changed to Sunday, why did not Paul tell them they would not have to wait a week, but the very next day, Sunday, was the proper day for this service? But notice what Paul did. "And the NEXT SABBATH DAY came almost the whole city together to hear the word of God." Here Paul waited a whole week, passing up a Sunday, in order to preach to the GENTILES on the Sabbath day. (2) Acts 15:1-2,14-21: Study this whole passage carefully. Certain men had come down from Judaea to Antioch, teaching that the Gentile converts there must be circumcised and keep the law of Moses to be saved. Quite a dissension arose between them and Paul and Barnabas. So it was decided Paul and Barnabas should go to Jerusalem to the apostles and elders about the question. "Wherefore my sentence is," he pronounced (verses 19-20), "... that we write unto them, that they abstain from pollutions of idols, and from fornication, and from things strangled, and from blood." He did not say they should not keep the Ten Commandments. The Ten Commandments were not in question — but only the ritual law of circumcision, which was an altogether DIFFERENT law. He merely mentioned four prohibitions, and otherwise they did not need to observe the law of Moses. "... For Moses of old time hath in every city them that preach him, being read in the synagogues EVERY SABBATH DAY" (verse 21). Do you see it? The law of Moses — the first five books of the Bible — was being taught in the synagogues EVERY SABBATH DAY. The apostles were WRITING only these decrees, BECAUSE GENTILE CONVERTS WERE GOING TO CHURCH ON THE SABBATH DAY. They had heard God's law read and expounded every Sabbath in the synagogues and did not need further instructions. It shows that the GENTILE CONVERTS HAD STARTED KEEPING THE SABBATH DAY, AND WENT TO CHURCH ON THAT DAY! And the apostles letter did not reprove them for this Sabbath-keeping. This is very significant, since GENTILES HAD NEVER KEPT THE SABBATH. Therefore it is something these Gentiles had STARTED doing after they were converted under the teaching of Paul and Barnabas! (3) Acts 16:12-15: Here we find Paul and Silas at Philippi. And "we were in that city abiding certain days. And ON THE SABBATH we went out of the city by a river side, where prayer was wont to be made, and we sat down, and spake unto the women which resorted thither. And a certain woman named Lydia, a seller of purple, of the city of Thyatira, which worshipped God, heard us: whose heart the Lord opened ... and ... she was baptized." Here again Paul and his companions waited until the Sabbath, and then went to a place of worship, and preached, and this woman, probably a Gentile, was converted. The passage indicates it was the CUSTOM to meet there on the Sabbath, and that it was CUSTOM for Paul and his companions to go to a place of prayer and worship when the Sabbath day came. (4) Acts 18:1-11: "After these things Paul departed from Athens, and came to Corinth; and found a certain Jew named Aquila ... with his wife Priscilla ... and came unto them. And because he was of the same craft, he abode with them, and wrought: for by their occupation they were tentmakers. And he reasoned in the synagogue EVERY SABBATH, and persuaded the Jews and the Greeks. Now the commandment says: "Six days shalt thou labor, and do all thy work," just as much as it says "Remember the sabbath day, to keep it holy." There is just as much command to work six days as there is to rest the seventh. And so if the day had been changed, Paul would have had to work Sabbaths, in order to go to church and preach every Sunday. But here he WORKED weekdays and went to church and preached EVERY SABBATH — not just on one particular occasion — it says EVERY SABBATH. He preached Christ and the Gospel of the Kingdom. And when the Jews became offended and blasphemed, he turned away from the Jews altogether, and from then on preached TO GENTILES ONLY (verse 6), and he continued there a year and six months (verse 11) — working weekdays — preaching to Gentiles ONLY — EVERY SABBATH! What MORE conclusive proof could we desire? What STRONGER Bible evidence than this, as to the true Sabbath of the NEW Testament? For a year and a half Paul continued working weekdays — six days — including Sundays — and preaching to GENTILES exclusively EVERY SABBATH! Certainly it was his custom and manner! Certainly he could not have done this had the Sabbath been done away, or changed. To these Gentile-born at Corinth, Paul COMMANDED: "Be ye followers of me, even as I also am of Christ" (I Cor. 11:1). And Paul "as his manner was, went in unto them, and three SABBATH DAYS reasoned with them out of the scriptures (Acts 17:2). It was his MANNER, his CUSTOM, as we have seen by ample evidence showing a total of eighty-four different Sabbaths Paul is shown specifically to have kept. Did he follow Jesus in this? Why, CERTAINLY! Jesus, "as his custom was ... went into the synagogue ON THE SABBATH DAY (Luke 4:16).